Did you know that Ballard was once informally known as Farmdale, WA? So said a note on the back of one of the photos that Paul Dorpat and Jean Sherrard shared with a crowd of about 80 neighbors at the Sunset Hill Community Association this Wednesday. 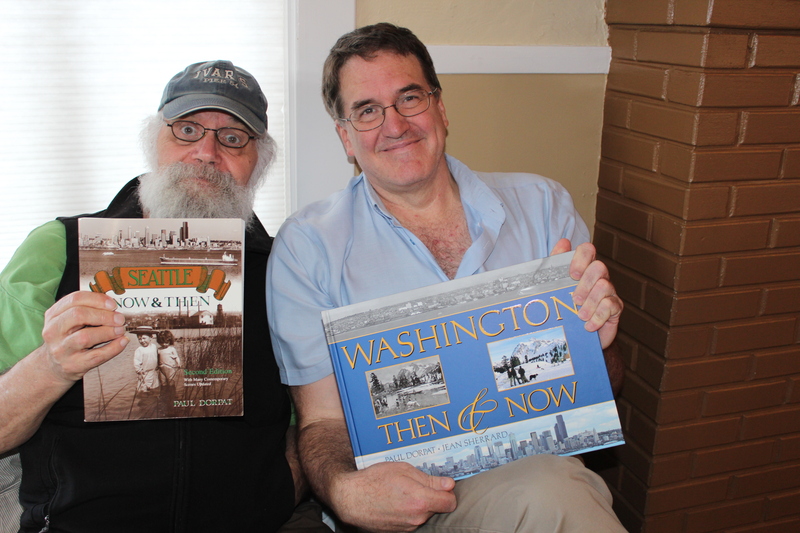 Paul Dorpat and Jean Sherrard of the Seattle Times column “Then and Now” and other photography ventures, joined the Ballard Historical Society for a talk on the myriad of roads leading to and from Ballard. Views of Manning’s (later Denny’s), Bartell Drugs, and a very snowy Ballard Avenue, and a photo of Midwives from Iceland were delights to those in attendance. “Then” photos dating back to the 1880s were supplemented with more recent “Now” photos from Paul’s and Jean’s collection. 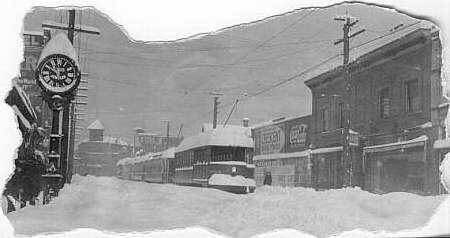 How Ballard has changed! Thank you to Sunset Hill Community Association for co-sponsoring our event, and those who coordinated setup, sign up, donations and book sales. And of course thank you to those who donated to help SHCA and BHS bring Jean and Paul to Ballard. About Paul Dorpat: Beginning in 1982, Seattle historian and photographer Paul Dorpat published the “Now & Then” column in The Seattle Times: Pacific Magazine. The column originally compared two photographs, “repeating” a view of downtown Seattle taken in 1919 at Pike Street and 4th Avenue with a view of the identically located but very different Pike Street and 4th Avenue taken in 1981. Dorpoat continued this series of Seattle photographs — her streets, lakes, docks, buildings, bridges, hills, regrades, visitations, and occasions. Jean Sherrard: Jean Sherrard has worked as an actor, writer, director, photographer, teacher, carpenter and private detective. Co-founder of the Globe Radio Repertory, he wrote and directed scores of radio plays for National Public Radio. His photos and articles have been featured in numerous publications. Interested in supporting us? Please consider a BHS membership, so we can continue to celebrate Ballard’s history and culture. This entry was posted in Archives, Ballard Avenue, Ballard History, Ballard News, Ballard Transportation, BHS Lectures and Programs, Membership, Photographs and tagged ballard historical society, jean sherrard, paul dorpat, seattle history events, seattle times. Bookmark the permalink.